﻿ A Look at Tourist Safety in Huatulco MexicoIs Mexico Safe? Huatulco finds itself in a unique place along the Pacific coast. Miles of beaches stretch along the city, each tucked away in one of the many bays that dot the coastline. On the other side, a lush jungle sits just outside the city. There, waterfalls, wildlife, and the chance for adventure tempt visitors away from the crystal clear waters. It is without a doubt that Huatulco is a natural paradise for those that want to break from the norm. Though for all the natural wonder, is Hualtuco safe? Well, for that answer we need to take a look at reports on tourist safety in Huatulco Mexico. Entonces, let’s jump into it! Well, as safe as any place can be in the world. Certainly, there is not a place on this planet that can be considered completely safe. Wherever you go you will find instances of crime and unsavory situations. So given that Hualtuco is a city like any other, albeit a bit more beautiful, the same is true. Though, Huatulco has been rather isolated from much of the strife experienced in the Oaxaca for the most part. Violent crime is almost unheard of and even petty crime is not a regular occurrence. Huatulco is often considered to be safer than most when compared to other popular tourist locations. Though, that doesn’t mean you should act as if the area is devoid of crime. Simply go about your stay as you would anywhere else back home. If you want a few tips, you could always check out our guide for staying safe on vacation. So that said, let’s explore some of the beauty that Huatulco has to offer. The city of Huatulco draws visitors to its borders with the allure of its beaches and jungles. Where else can you spend the morning lounging by the beach before heading off to explore the jungle? While still being able to catch the sunset with a margarita in hand? That beauty is on full display everywhere you go in Huatulco. Whether you decide to spend the afternoons working on a tan. Or if you enjoy spending evenings playing beneath a waterfall, Huatulco has something for you. That’s the amazing thing about Huatulco. The natural beauty that surrounds the city is unlike other tourist destinations. And locals know it. There is an increased focus on enjoying the natural wonder while protecting it within the city. It’s evidenced by the city’s commitment to sustainability and protecting its lands. As the rest of the world begins to focus on learning about sustainability, Huatulco puts that principle into practice. Aside from always improving its methods for reducing waste, the city has designated much of its land as protected. These areas are to remain undeveloped and sanctuaries of types for the very thing that makes Huatulco beautiful. 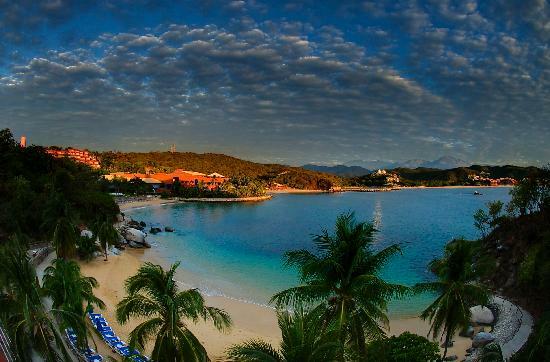 This ensures that the natural wonder of Huatulco will be there for generations to enjoy. So…what about tourist safety in Huatulco Mexico? It’s as safe as it is beautiful. And what’s more, it’s a place full of natural wonders and laid back vibes. So it’s perfect for anyone looking for something a little different than your standard Mexican vacation. In this jungle getaway tourist safety in Huatulco Mexico and preserving the nature take a forefront position in local authorities priorities. So if exploring jungles, swimming in clear waters, and relaxing sound like your thing, give Huatulco a try.